Search all fields in the table and show matching lines. Open University Milton Keynes, UK School parties by arrangement from 1100. Open to the public from 1600 for viewing opportunities, talks and fun science demonstrations. Entry free, but registration appreciated. Details here. Volkssterrenwacht Antwerpen Hove, Belgium Sterrenwacht van Antwerpen. Royal Astronomical Society Burlington House, London, UK Viewing from courtyard, teacher activity pack available. We will be running two simultaneous events, one in Oxford and one in Banbury, both running from midday to 3pm. We will have a range of ways to safely view the transit, including projections of the sun, telescopes with professionally made solar filters and solar telescopes designed specifically for observing the sun. Highlands Astronomical Observatory Inverness, UK At Culloden Battlefield, H-Alpha and white light solar scopes will be set up. The Knowledge Observatory Confolens, 16500, France website. free public event for schools and local people. Free solar filter for cameras and telescopes. Hampstead Scientific Society Hampstead Observatory, London, UK We'll open our doors to the general public free of charge (donations gratefully recieved) on May 9th 2016 from 12am until the Sun is lost from our location (sometime around 19:00). If the weather is bad we may not open so see Facebook: Hampstead Observatory on the evening of the 8th May for updates. For more info on Hampstead Observatory; our normal openings and how to find us, see our website. Royal Observatory Greenwich Royal Observatory Greenwich, London, SE10 8XJ, UK The Royal Observatory Greenwich will be providing the public with opportunities to see the transit of Mercury through a range of telescopes. There will be free telescope viewings next to the Astronomy Centre (in conjunction with Flamsteed Astronomy Society), plus special ticketed sessions to view the event through the largest lensed telescope in the United Kingdom, the Great Equatorial Telescope, for the first time since 1927. More information and booking via the Royal Observatory website. High Legh Community Observatory High Legh, Cheshire, UK More info. Estação Astronômica PieGis Juazeiro do Norte, Ceará - Brazil Free public event for students and residents near the Estação Astronômica. Two telescopes will be available for the observation of transit. University of California, Riverside Riverside, CA, USA More info. HINSPIRIA science centre Sarpsborg Norway H-Alpha and white light solar scopes will be set up. More info. LYRA Royal Green, Marine Parade, Lowestoft, Suffolk, UK Full range of H Alpha scopes plus White Light filtered Telescopes. 12:00 till 5:00pm weather permitting. The Observatory Science Centre The Observatory Science Centre, Herstmonceux, Hailsham, East Sussex, UK The Observatory Science Centre will be open until 8:00pm on May 9th and viewing of the transit will take place from midday. We will be using a 90mm solar telescope, a 40mm solar telescope and Sunspotters. We will also have some solar viewing glasses for visitors to borrow. Members of the local astronomical society will have their own solar viewing equipment and will be on hand to answer any questions about the transit. More info. Smithsonian National Air and Space Museum Phoebe Waterman Haas Public Observatory, Washington, DC, USA More info. The Observatory will have multiple solar-safe telescopes available for the public to view the transit of Mercury. There will also be a live online stream of the Observatory's view of the transit throughout the day at More info. Both the in-person observing and the online stream are weather-dependent. Check for the live stream link, photos of the transit in progress, and weather updates from the Observatory on Twitter via @SIObservatory. National and Kapodistrian University of Athens Department of Physics, University of Athens, Athens, Greece The Gerostathopoulio University Observatory organises a special public event devoted to the Mercury Transit on 9 May 2016. The event will take place at the Physics Department of the University of Athens. It will start at 4pm and will comprise solar observations with telescopes, public talks and games for children. See program. Institute for Physics / IGAM University or Graz, Graz, Austria Telescopes on the campus will allow a safe and sharp view on the transit. In addition, a livestream will be displayed in the foyer of the main building. For those interested in the history of the institute, guided tours to the historic refractor will be offered. Dipartimento Interateneo di Fisica "M. Merlin" Bari, Italy Bari Local Committee of The AISF (Italian Association of Physics Students) invites students to watch a live streaming of Mercury Transit. The event will start at 1.30 pm and will take place at Physics Department of the University of Bari "M.Merlin"
Recreation and Park Commission for the Parish of East Baton Rouge Highland Road Park Observatory, Baton Rouge, LA USA The Baton Rouge area will experience most of the Transit of Mercury. HRPO will be open to the public from 6am to 2pm Central Daylight Time. Personnel will have at least six telescopes (projection, optical and hydrogen-alpha) in operation, as well as a live feed from the Solar Dynamics Observatory. There will also be an opportunity for patrons to create their own projection devices! The event is for all ages and there is no admission fee. HRPO is located at 13800 Highland Road in Baton Rouge. HRPO's two other partners are Louisiana State University and the Baton Rouge Astronomical Society. Louis Cruls Astronomy Club Praça São Salvador, Campos dos Goytacazes, Rio de Janeiro, Brasil We are organizing a big event at the main public square of the city of Campos dos Goytacazes, located in Rio de Janeiro State, Brasil. We will have two solar telescopes and wil also project the image of the Trasit of Mercury in a big screen. Estamos organizando um grande evento para observação do Trânsito de Mercúrio na Praça São Salvador, na cidade de Campos dos Goytacazes, no estado do Rio de Janeiro, no Brasil. Estaremos com dois telescópios solares e uma tenda onde serão projetados em uma grande tela as imagens do trânsito de Mercúrio. Durante o evento estaremos ministrando palestras no Museu Histórico de Campos dos Goytacazes. O evento está sendo organizado pelo Clube de Astronomia Louis Cruls com apoio do Charlie Bates Solar Asronomy Project. 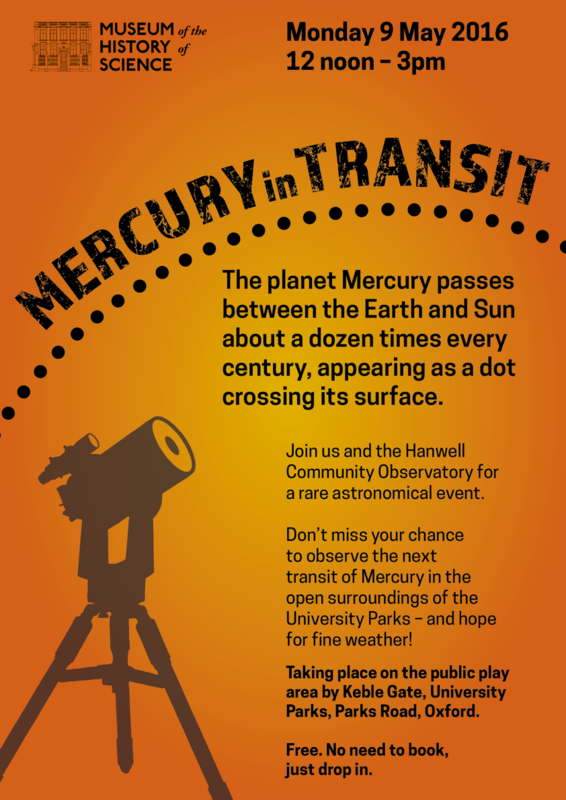 University of Oxford Frideswide Square, Oxford, UK Physicists from the University of Oxford will be on hand with solar telescopes to show you the transit of Mercury outside the Said Business School on Frideswide Square throughout the transit. Silesian Planetarium Silesian Planetarium and Katowice main square, Poland Observations are totally free. Wakefield and District Astronomical Society Overton Cricket club, Middlestown, Wakefield, Yorkshire UK From 12.00 noon right through until 8.00pm. We will have dedicated solar scopes and other scopes with white light solar film for use of anyone who wants to attend, with plenty of astronomers on hand to answer questions from members of the public.